As a working parent, we miss a lot of things that we don’t want to in our children’s lives. Too often, someone else experiences the first step, first word, and the special things during the day like songs, creations, and snuggles. Of course, none of us like this or wanted this, but either by choice or by necessity, we can’t always be there. When I first went back to work after my first born’s birth, I cried. I was told it would get easier, but a year later, I was still crying. I’ve finally stopped crying–most of the time. I think I’ve become numb in many ways to having to leave my children in order to provide for our family, but I have never lost the hope, drive, or passion to get myself to a point where I can support our family from home…and be with my kids! I was recently told about a great new iPhone App called “Karoo” that, I think, will be a big help to the heart of parents and grandparents (and maybe some Aunts and Uncles!) who can’t always “be there.” This app allows those who you choose to basically have access to any updates you (or your caregiver) make about your children. The caregiver can post twitter-style notes, photos, videos, etc. throughout the day and the program will arrange it in a timeline fashion so you can access it whenever you are available to. Unfortunately…I don’t have an iPhone, iPad, iPod Touch, or any other “i” device which would let me use this app! 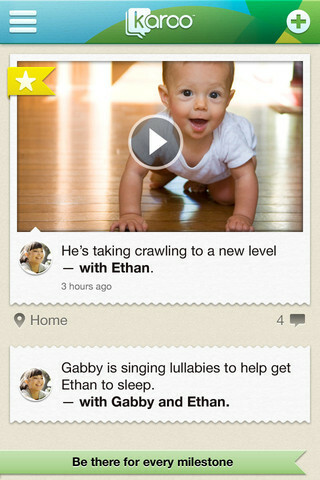 But just in case you do, check it out and feel more connected to your babies!